Normally, dragging the mouse moves the cursor on the construction plane in the active viewport. Simply move the cursor to another viewport to change the construction plane. Locks the next point will be placed at a specified distance from the last point. Type a number at the command prompt and press Enter. The marker moves around the last point at the specified distance. Start the Line command, and place the first line point. At the End of line prompt, type 4. The line endpoint moves around the last point 4 units away. Click to place the point, or, type an angle, and press Enter. Locks the next point will be placed at a specified angle relative to the last point. Type an angle at the command prompt in the format <angle and press Enter. The cursor moves along a line at the specified angle. The angle constraint can also be used for finalizing the pick in elevator mode. At the End of line… prompt, type <20. The line is restricted to 20-degree angle increments. Click to place the point, or, type a distance, and press Enter. The distance and angle constraints can be combined. At a prompt type the @ symbol, or type r to set the distance relative to the last point. At the End of line… prompt, type @5<45 or r5<45. The line is drawn 5 units from the last point at the angle 45 degrees from the first point. The Tab key locks the cursor's direction of travel. When drawing, after placing the first point, drag the mouse to a new location and tap the Tab key to lock the direction. Use an object snap to locate a specific location on another object. The marker is now constrained along the line between the first point and the point where the marker, was when you tapped the Tab key. If grid snap is on and ortho is activated, the direction lock snaps to grid lines. Use the direction lock constraint when you want the line to pass through the end of a curve and then go beyond it. Turn on end object snap. 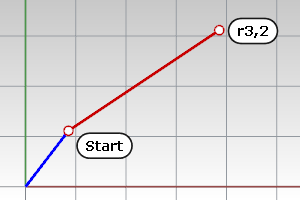 When you move the cursor close to the end of the curve, the marker snaps to the curve end. Tap the Tab key and then move the mouse beyond the curve end and pick. The line will pass through the end of the curve. Use direction lock constraint combined with the distance constraint to draw a curve of a specified length and then constrain the angle with the Tab key. A second tap of the Tab key will set Rhino into a tracking mode on a circle where, instead of locking to a line defined by the last pick point and the 3‑D mouse location when the Tab key is tapped, Rhino tracks to a circle with the center at the last pick point and the radius defined by the Tab tap location. When drawing, after placing the first point, drag the mouse to a new location and tap the Tab key twice to lock the circle radius. Specify a point that is a given distance above or below a point on the construction plane. Ctrl + left mouse click. Start the Curve command and place the first point. At the Next point of curve... prompt, pick another location in the perspective viewport. At the Next point... prompt, hold Ctrl and pick a point in the perspective viewport. Drag the mouse in the perspective viewport. A tracking line displays, indicating that the marker is constrained to move perpendicular to the construction plane. Click to select the point. Notice the location of the marker in the other views. Select the objects to move. Hold Ctrl and click and drag the selection set. A tracking line will connect the point you picked to the marker, indicating the new location of the selection set. Release the left mouse button to place the objects. After starting elevator mode, hold Ctrl and click the left mouse button again. You can start elevator mode in another location. Start the Line command and place the first line point. At the End of line… prompt, move the mouse to the location where the line should end. Hold down Ctrl and click to activate the Elevator mode. Release Ctrl, type <30 and press Enter. A line is drawn at 30 degree angle to the construction plane, ending on the elevator line. Press Ctrl, and click to start elevator mode. Change viewports, release Ctrl and click again. A new elevator mode starts relative to the new construction plane. Release Ctrl, press Ctrl again, and click. Elevator mode can also be activated from direction lock, but only if the command allows 3‑D points. Type a number at the command prompt to specify the elevation of the point. Positive numbers are above the construction plane, negative numbers are below. Specifying 3-D points using 2-D input devices (the mouse and monitor) is aided with construction planes. Anything drawn in Rhino by simply picking points is always drawn on the construction plane of the current viewport. Point filters extract individual x, y, and z coordinate values from different points to create a new, composite point. You can use point filters to pick one coordinate value at a time while temporarily ignoring other coordinate values. If you use point filters with object snaps, they extract coordinate values from an existing object so you can locate another point. After you specify the first value, you are prompted for the remaining values. Point filters only work when 3-D input is allowed, and you cannot start with one point filter and then apply another one. To place a point at the x coordinate of the right end of a line and the y coordinate of the left end of a line. At the Location of point object prompt, type .x. At the X coordinate of prompt, with the End object snap activated, pick the right end point of the line. This sets the x coordinate of the point to the right end of the curve. At the next Location of point object prompt, type .y. 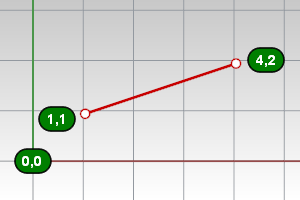 At the Y coordinate of prompt with the End object snap activated, pick the left endpoint of the line. This sets the y coordinate of the point to the left end of the curve. At the Location of point object prompt, pick to place the point. If you specified an x value, the coordinate of the new point matches the x value of the first point and the y, z value of the second point. Use numbers for entering distances, angles, and point coordinates. No spaces are permitted in a number, angle, or x, y, z coordinate points. You can specify units when typing lengths and point coordinates. The numbers will automatically convert to the model's units. For example, if your model units are meters, and you type 27cm, Rhino automatically converts your number to 0.27. This also works for converting feet and inches or any other unit system. You can type x and y coordinates or x, y and z coordinates to place points. With the w prefix you can type world coordinates, with r prefix relative coordinates, and with wr prefix world relative coordinates. When Rhino prompts you for a point, if you type x and y Cartesian coordinates, the point will lie on the construction plane of the current viewport. At a prompt, type the coordinate in the format x,y where x is the x coordinate and y is the y coordinate of the point. At a prompt, type the coordinate in the format x,y,z where x is the x coordinate, y is the y coordinate, and z is the z coordinate of the point. To place a point 3 units in the x direction, four units in the y direction, and 10 units in the z direction from the construction plane origin, type 3,4,10 at the prompt. If you enter only x and y coordinates, the point will lie on the construction plane. 2,-11 (2,-11,0) When you omit the z coordinate, it is automatically set to 0. If you type only x and y coordinates, the point will lie on the construction plane of the active view. At a prompt for a point, type coordinates in the format x,y,z and press Enter. 0 (zero) is a shortcut for 0,0. Start the Line command and place the first line point at 0,0. This starts the line at the construction plane origin. At the End of line... prompt, type 12,6,10 and press Enter. The line is drawn from the construction plane origin to a point 12 units along the x-axis, 6 units along the y-axis, and 10 units along the z-axis of the current construction plane. The arrow icon in the lower left corner of each viewport displays the direction of the world x, y, and z axes. The arrows move to show the orientation of the world axes when you rotate a view. At a prompt, type the coordinate in the format wx,y, and press Enter. At a prompt, type the coordinate in the format wx,y,z, and press Enter. To place a point 3 units in the world x direction, 4 units in the world y direction, and 10 units in the world z direction from the world origin, type w3,4,10 at the prompt. W0 is a shortcut for w0,0,0. Type w in front of the coordinates, to use the world coordinate system; otherwise the construction plane coordinates of the active view are used. Start the Line command and place the first line point at w0,0,0, and press Enter. This starts the line at the world coordinate origin. At the End of line... prompt, type w12,6,10 and press Enter. The line is drawn from the world origin to a point 12,6,10 in the world coordinates. At a prompt, type the coordinates in the format rx,y where r signifies that the coordinate is relative to the previous point. At the Start of line… prompt, click to place the first end of the line. At the End of line… prompt, type r2,3, and press Enter or Space. The line is drawn to a point 2 units in the x direction and 3 units in the y direction from the last point. In commands like Line and Polyline, you can specify relative points. For an introduction to coordinate systems, see: http://www.mathopenref.com/coordintro.html. Constrain the marker to an exact location on an object such as the center of a circle or the midpoint of a line.